Jim here... Certainly, we're all familiar with the old saw, "You can lead a horse to water, but you can't make him drink," right ? So often, the life of a raw foodie is perfectly captured by that saying. We are, of course, the ones leading our equine brothers and sisters to the sweet trough of raw foods, just as others coaxed us into the barn for our first drink. Have You Been Led To This Post ?? So, what is this post It's a big old horse trough to which, if you're a raw foodie, you can lead others. Or, if you're someone unfamiliar with raw foods, and have been sent here by another, what you'll find below is the water. No one can make you drink it. And, please don't be offended at my comparing you to a horse because (1) we're all horses, (2) this is all just my strange opinion, and (3) horses are beautiful, magical beings! Being compared to a horse is a compliment! Something has come up and it may put some of our projects on hold for about six months, or so! What could come up to make us give up our goals/plans for 2009? 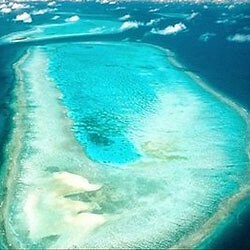 Umm...how about being awarded The Best Job In The World, the Island Reef Job! Australia is doing some major tourism marketing for their lovely Paradise Island. For six months an individual will live in a 3-bedroom home, comb the beach, blog about the experience, do some video blogging, respond to interviewers, feed fish, and just basically live a life in Paradise!! To live this dream life, you'll be awarded $105,000 USD and be flown to the island! Read more: Tour May Be Postponed--We May Live On An Island! Today's post isn't specifically about raw foods. But, we wanted to post a few videos highlighting some interesting research by an Italian doctor named Tullio Simoncini, who just might be onto something HUGE! Dr. Simoncini treats certain cancer patients with ordinary sodium bicarbonate (baking soda), based on his premise that cancer is a fungal problem and that a solution of baking soda is anti-fungal. Naturally, he's been vilified by the medical establishment for making such a seemingly simplistic claim. But, what if he's right? Here at Pure Jeevan, we're very much into health research -- not so much with an aim to cure any specific disease or ailment, but rather to understand ways in which our bodies can become what we like to call unbalanced, as well as the ways in which we might return our bodies to proper balance, when necessary. In this way, I suppose that we, like many in the natural health world, feel that the body is amazingly capable of healing itself (in many circumstances) as long as the body is able to find a favorable state from which it can properly do what it naturally wants to -- which is to return the body to an optimal state of health. Medical doctors don't buy into this theory very much. ?However, it's certainly ironic how, where certain areas of standard medical practice are concerned, what I described above is exactly what doctors do. Take something like a broken bone, for example. A doctor does not normally attempt to surgically repair the bone itself. Rather, the standard and time-honored practice is to set the bone (say, with a cast), and then to let your body heal the break naturally, on its own, making those skeletal connections as only the imponderably complex, ever-evolving wisdom of the human body can facilitate. (True, doctors do often intervene these days with surgery for broken bones. But, their aim there is mainly to position the bones for proper healing, and/or to do things like insert pins in an attempt to improve functionality after healing. Either way, the procedure here still relies on the body's ability to eventually heal the problem.) Standard medical knowledge in this area is without question outstanding -- and this is why most people in the natural health world have little problem with going to see a medical doctor for emergency treatment. I hear the question all the time: "Don't you miss eating out at restaurants " My answer is always, "No. I prefer the fresher organic foods I can create for myself in my own home. I can pay the same amount for better food if I stay at home to eat." It's true, too. I don't miss eating out at restaurants. Sometimes I miss the convenience of someone else doing my food prep and cleaning up afterward, but as far as the actual food that I consume, I prefer the foods we eat at home. Besides, when you eat out as a raw foodist, your choices are limited to only a salad if you live in an area with no raw food restaurants. Sometime last year, as a treat for Jim, we went to a restaurant. I got a huge salad that I used to love when I ate cooked foods at that particular restaurant. I remembered the greens were always dark, the onions were nice and flavorful, and the dressing was a simple oil and vinegar with salt. Well, after consuming only fresh foods in our home for quite some time, the salad that I used to think tasted so great now seemed to be lifeless and limp. It wasn't enjoyable to eat, and I sure didn't like paying so much for a nonorganic salad that didn't even taste good to me. So, we didn't eat out again after that. 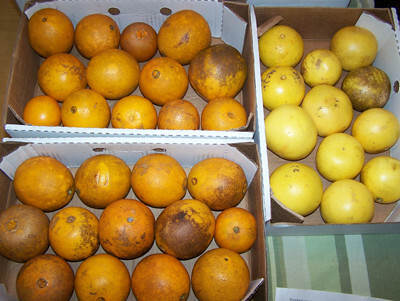 Read more: The Oranges are Here, the Oranges are Here! Brutal Honesty. 100% Transparency. Unedited Feedback. Absolute Truth. ... How often are we treated to these things by those we know? How likely are we do conduct ourselves with these ideals in mind? Propriety. Politeness. Decorum. Political Correctness. ... How often do these conventions in others prevent us from knowing what others think of us? How often do these conventions in ourselves restrict our own words when directed at others? Hi all-? Jim here from Pure Jeevan with our next eipsode of "Know Your Food."? This is "Episode 2 (salvaged): Turnips."? As far as that "salvaged" parenthetical... This relates to the story I told in our first episode -- about how we're planning to upgrade our video equipment, audio equipment, video editing software, and more. I hope you like it, though. Still working on getting them down to 3-4 minutes. This one's just over 5 minutes. If you're wondering how Wendi became strong as Xena Warrior Princess, you'll have to watch this vid! So, to summarize:? Turnips are great for the root portion (the turnips, proper) or the greens. (Here at Pure Jeevan, we like to use turnips as shells for rawvioli, or simply sliced and served with a little salt. The greens are great juiced!)? Turnips are starchy, but not as heavy as potatoes, and are a great Vitamin C source. They contain fiber, manganese, pantothenic acid, thiamine, potassium, folic acid, copper, niacin, B6, E, riboflavin, and more. The greens of course have calcium, and are a particularly great source of folate (esp. important for pregnant women) and many of the vitamins and minerals listed previously, along with Vitamin A. Read more: Know Your Food Episode 2 (salvaged): Turnips!